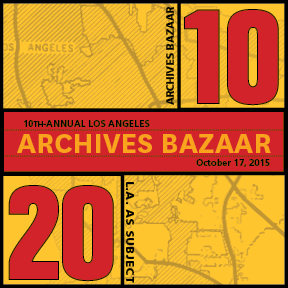 LAPNet steering committee members Dawn Jaros and Jeffrey Thompson will present “Preserving Memories: How to Care for Photographs and Scrapbooks from Archival Treasures to Family Heirlooms” this Saturday, October 17, at the 10th Annual Los Angeles Archives Bazaar. The Archives Bazaar is held at USC’s Doheny Library. Arrive early – the presentation kicks off the Day of Preservation at 9:00 AM!!! Designed for both the novice and professional, this session will cover care and conservation tips for photographs as well as scrapbooks. Topics will include various film formats, print types, and guidelines for the best archival practices for long-term preservation of both black & white and color film. The scrapbooks section will focus on proper supplies, storage, care, handling, and display solutions for them. Presented by the Los Angeles Preservation Network, and featuring photo archivist JEFF THOMPSON of Twentieth Century Fox and conservator DAWN JAROS of the Academy of Motion Picture Arts & Sciences.